I photographed this coach near to Stalybridge Station in March 1966, but until recently, the only information I had was what could be seen in the photograph. Searching the web for more information, the first thing I found was that somehow, someone had got hold of a copy of my photo, which didn’t make sense, as I had no recollection of having provided anyone with a copy. The thumbnails in Google Images was at first sight the spit and image of my picture. 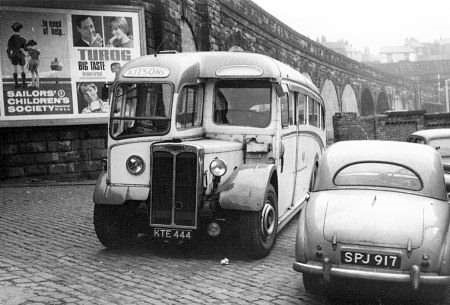 The coach is clearly in exactly the same spot, taken from exactly the same location, and exactly the same Austin A40 is parked next to it. However, opening up the picture to the same size made it clear that the two images are simply a remarkable coincidence. The other picture was taken several months later, and there are two distinguishing features. Firstly the A40 is facing the other way, and secondly, sadly, someone has made a serious dent in the Crossley’s radiator. Of interest to me is the chrome radiator, which I am not aware of having seen on any other Crossley. Presumably it was an optional extra on coaches. Importantly, the picture and the comments with it gave me some information about what the coach was used for. It appears that it was on regular hire to Stockport High School to ferry sports teams around. Looking at Bus lists on the web, it is clearly one of three similar vehicles delivered in December 1949 to Broughton and Walker of Great Harwood, registered KTE 443/444/446 but more interestingly, KTE 441/442 were similar chassis (and body, although C33F) delivered in October 1949 to Robinson, Great Harwood. Were these perhaps a joint order, or were the two firms linked? More peculiar than the chrome radiator, a lot of later Crossleys had them, so it was probably a customer option. More peculiar is the autovac, something I have never seen before on a Crossley. Given the dubious reputation of the Crossley HOE7 engine, has it been changed for something else? Broughton & Walker was part of the Holdsworth Group which owned Robinson’s of Great Harwood. They were to all intents and purposes part of Robinson’s, in the same way that Walton & Helliwell of Mytholmroyd was directly run by O.& C. Holdsworth of Halifax. Looking at chassis and body lists it will often be seen that the Holdsworth Group bought batches of a type with consecutive numbers and allocated them to their various subsidiaries. Oldham Corporation had both single and double deck Crossley buses with the chrome radiator with vertical centre strip. The picture appears to be more complicated. We had an ex-Darwen Crossley that had been cut down for use as a gritter and that had an Autovac – I remember how it gurgled to itself when we shut the bus down. However, I look at photos and see there’s no Autovac on the bulkhead which means it was under the bonnet. As a consequence it’s difficult to tell which Crossleys have one and which don’t. That also doesn’t explain why the one in the photo has one visible on the front bulkhead. Knowing what I do about the operator, I think it’s highly unlikely there was anything but a standard power unit under the bonnet. I note also that this one has had its front wings trimmed back slightly. The chromium plated radiator shell became an option from 1949. It was usually applied to single deck coaches, but an alternative version without the central dividing strip was offered mainly for double deckers. Older chassis were sometimes retro fitted. Could that be an Autovac in 1949… or? Would still be grateful if anyone can tell me what a Potts Patent air Exchanger is, as found on Tony Peart’s 122? Surely the car is an A35 as the A40 had a larger back window. No David, I think its definitely an A40 Somerset. The A35 had, pro rata, a larger rear screen than the A40 Somerset. And on my A30 and A35 the boot had hinges at the top not the bottom. Potts was the MD at Doncaster at the time number 122 was being built. The Patent Air Exchanger is an early form of air conditioning. It consists of a large fan unit that effectively blew fresh air collected at the front of the bus and forced between the upper deck floor and the lower deck ceiling, before venting out of the rear platform. Next time you get to see the bus have a look at the perforations in the ceiling panels where the air comes out. I don’t know if it worked upstairs as well) Tony told me it was a battery flattener (engine off) but was happy to demonstrate it working many years ago. This is an interesting photo: the ‘twin’ photo which initially fooled Alan is to be found here: www.flickr.com/photos/ The Austin A40 has travelled far from its original stomping ground, PJ being registered in Guildford, Surrey. And the poster is also interesting in that it has two accurate ‘possessive case’ plurals, the first apostrophe being after the first ‘s’, but the apostrophe being before the second ‘s’, because children/men/women are rare plurals without an ‘s’ on the end! BTW – the society still exists. But I see I’m boring you! In the ‘Flickr’ version, the engine cover has either not been closed properly or the vehicle is in a state of distress . . . Yes, in the ‘Flickr’ version, it looks like there has been an impact to the front. The registration plate is bent, and possibly the radiator itself has moved back a bit at that point. The result is that neither the bonnet top or side can now be fastened down, hence the "state of distress" so aptly described by Pete! So what happened in the months between the two pictures being taken? We’ll probably never know! Hopefully the coach was carefully repaired. I would guess that Alan’s photo showing the Crossley in reasonable condition is the earlier of the two. The Flikr pic shows the bonnet structure on the point of disintegration and the number plate has been re-profiled by accidental damage. This location must have been the regular parking place for the coach and the Austin. And well spotted, Chris, about the correct application of the apostrophes, something decidedly rare these days. Pete- it is either because of the bump mentioned here (look at the lower part of the radiator) or an advanced cooling system- not sure if Crossley needed it but Daimler engines seemed to. Mike B- thanks for the info re POTTS PATENT. I’m yet to see 122 at close quarters: it did have a few later close cousins at Leicester Ave I think (but presumably only 7ft 6in wide!) but not seen "Potts" before. It is interesting that a municipality which couldn’t cope with enclosed radiators, automatic changes or 8ft bodies for many years had previously bought a bus with so many "revolutionary" features for that time. What became of Mr Potts and when, because that’s probably the answer? The real need was surely upstairs where the fag fug made breathing difficult! It is a pity that the reputation of the HOE7 continues to be unjustifiably traduced. It is certainly true that the earlier versions of the HOE7 were not that successful, but the later downdraught version was a good engine. AEC engineering designers certainly played a large part in that. Birmingham for example managed to get between 18 and 19 years out of their downdraught DD42/6s. According to Messrs Eyre, Heaps and Townsin (Crossley OPC 2002) Birmingham rated their HOE7s rather better than their Daimler engined CVDs. I drove a few thousand miles in HOE7 powered Crossley in the late 60s/ early 70s, and considered their hill-climbing abilities more than acceptable. The vehicle was certainly in a state of distress when the Flickr photo was taken, with the radiator substantially stove in. Also, that picture has the A40 the other way round, confirming the model. Thank you to those who have sorted the matter of the chrome radiator. I’ve read of Crossley’s HOE7 in different places. Why does it always conjure an impression of one of Birmingham’s Crossleys? No, the reputation of the HOE7 has not been unjustifiably traduced. The initial design incorporated the principles of Saurer’s four valve cylinder head, and was outstandingly successful. On the strength of demonstrations by the prototype DD42/1 orders flooded in and Crossley fully anticipated capturing the bulk of Manchester’s future bus requirements. However, when Saurer requested a licence fee for the use of its cylinder head design, Crossley Motors MD Arthur Hubble refused to pay and a hurried two valve redesign was instigated. This crippled the breathing, caused serious crankcase back pressure and led to very high oil consumption, resulting in an unreliable unit that was deficient in power output. Customers who had been impressed by the prototype found that the beast they were receiving was something of a curate’s egg, good in parts (the chassis was excellent apart from heavy steering) but seriously abysmal in the engine department. Many early recipients, notably Manchester, didn’t trust Crossley ever again and never went back for more, though the less demanding nature of coach operation did not tax the engine so severely. When AEC took over Crossley in 1948, it did not have an engine of around 8.5 litres of its own, so it instructed its new subsidiary to rectify urgently the deficiencies of the HOE7, and also offer the DD/SD42 with Gardner engines as options. Hubble, ever resistant to AEC “interference”, soon (and probably deliberately) crossed the equally autocratic Hugh Gardner, who adamantly refused to supply Crossley with any LW engines. AEC then ran out of patience with Crossley and itself produced the design for the greatly improved “downdraught” HOE7/5 in 1949. This differed quite significantly from earlier versions of the HOE7, and conversion of old engines to the downdraught head was an extensive and costly exercise, so most remained unaltered. Incredibly, despite at last having a competitive power unit, Crossley still continued to supply some outstanding customers with the earlier version of the engine, presumably to use up stocks of old components. The downdraught HOE7/5 certainly did remedy the basic faults of the Crossley engine, but by late 1949, when this engine was fully available, the heyday of bus orders was over, and, largely because of its earlier failings, the Crossley Motors undertaking was in terminal decline. Had the original four valve engine been offered as the standard power plant from first production, then the impact of Crossley upon early post war bus deliveries would undoubtedly have been much more significant. "My personal honour is more important than the future wellbeing of the company and its workforce…!" A sadly common disease in industry of all descriptions. A few years on, some operators – mostly municipal ones – re-engined their Crossleys with other types presumably removed from older withdrawn vehicles. I’m sure I’ve heard of Gardner 5LW, AEC 7.7 and Leyland 8.6 engines being substituted. If the main deficiency in Crossleys was related to their HOE7 engine and it was otherwise an excellently engineered bus (and especially if it had a well built Crossley body), then this should surely have then made them into good buses. Yet we never seem to hear of how these re-engined Crossleys performed – I’d be very interested to learn, though I don’t suppose there will be many former engineers or drivers with experience of them around these days. I did once drive the former Rotherham Crossley – HET 513 – whilst it was in the care of Geoffrey Hilditch at Halifax. Presumably, being the last DD42 built, it would have had the later redesigned engine, but other than having heavyish steering (though probably no more so than a CVG6) and maybe its performance on hills was not exactly sparkling, I found it a fairly pleasant bus to drive, with the easiest of gearchanges, good visibilty due to the low bonnet line, and possibly the best suspension of any halfcab I’ve ever driven. It got so near to being a really good bus. The Portsmouth Crossleys were delivered with turbo transmitters, which I understand would have limited performance even more! Those with Crossley bodies (25 of them, new in 1949) were re-engined c.1957-59 with Leyland engines from withdrawn TD4s. In this guise they were switched from cross-town routes such as G/H and O/P to trolleybus conversion routes such as 19/20, this demanding route being extended. Many of the batch also had seating increased from 52 to 58. I think that this amply bears out evidence of the effect in the improved performance from the change in engine for these buses. There were six with Reading bodies which retained original engines and transmission, and were retained on cross-town routes and school specials, etc. I was a schoolboy at the time, so unfortunately driving experience is nil! Roger, thank you for a fascinating insight into the sorry saga of the Crossley HOE7 engine. I don’t know a great deal about Crossley, but am aware through reading various bus articles over the years that there was a problem with at least one of its engine types. It is a real shame that the apparent foolhardiness/stubbornness of Arthur Hubble’s "spoiling the ship for a ha’porth o’ tar" in effect brought the Company down, especially as you say that the prototype proved popular and orders started to flow in. I seem to recall that Dennis had success with its ‘four valves per cylinder’ engines, designed with Saurer involvement. Would I be right in thinking that Dennis simply paid Saurer the licencing fee for the right to build a superior product? Just as Arthur Hubble, with hindsight, should have done? There is no doubt as Roger Cox says, that the post war saga of "what might have been but never was" as far as Crossley is concerned, is a valedictory lesson, but then there have always been personalities in the bus industry with more ego than common sense. I can only speak as I found almost 50 years ago that the FINAL version of the Crossley engine was a fine bit of engineering. Now as to who takes the credit for that whether it be Crossley, AEC, Saurer, or any individual, I know not; and I still believe that particular engine has been unjustifiably maligned because of the wider problems of and within the company. I often travelled on the Portsmouth Crossleys, both with Crossley engines/Brockhouse Turbo-transmitters and Leyland engines. It is difficult to compare performance of both types, because the original setup required no delays through gear-changing, compared with the Leyland engines/gearboxes. Portsmouth routes being flat would not challenge their hill-climbing abilities.My view is that the conversions took place in order to save fuel, since these engines were running up to the governor whilst accelerating, although they did freewheel along briefly until the next reason to slow or stop. Without the ability to use engine braking, I imagine that brake shoe wear was greater than otherwise, too. Joe asked in an earlier posting "what became of Mr. Potts and when?" Tom Potts was the first Transport Manager of Doncaster Corporation, apparently took office in 1920 and claimed the chair until he retired in 1953, to be replaced by Tom Bamford. For further info., see the 3-part article on Doncaster Corporation in ‘Buses Illustrated nos. 60-62, for the months March – May 1960! My 1967 ‘Little Red Book’ lists A. Kitson & Son at 222 Mottram Road, Stalybridge.